SAN FRANCISCO, CA--(Marketwire - May 14, 2008) - Hansen Medical, Inc. (NASDAQ: HNSN), announced today that its Sensei™ Robotic Catheter System will be featured in 13 clinical presentations at Heart Rhythm 2008, the Heart Rhythm Society's 29th Annual Scientific Sessions in San Francisco, May 14 - 17 (Booth 2229). "We continue to be pleased by the demand for our technology and the clinical experience gained with the Sensei system," said Frederic Moll, M.D., co-founder and CEO of Hansen Medical. "Due to the fact that several of our installed sites no longer require clinical support from us, we aren't able to track every case completed. However, we are aware of a minimum of 600 procedures performed using our system for remote navigation, and we are confident the adoption of this technology in the treatment of complex cardiac diseases will continue to grow." Some clinicians using this new generation robotic technology are reporting high levels of confidence and less operator fatigue. Physicians of differing skill levels, from those at large teaching institutions and university medical centers to community hospitals, are able to employ the Sensei system within their practices. Additionally, certain physicians in the European Union are able to combine the use of the Sensei systems' remote navigation capability with state-of-the-art irrigated catheters to deliver more effective therapy during complex cardiac procedures. The CoHesion 3D Visualization Module, an integrated product that combines the 3D visualization of the EnSite™ visualization system from St. Jude Medical, with 3D navigation from the Sensei system, has been released in the European Union. There are currently six European Sensei systems configured with the CoHesion Module and some physicians are already reporting lower fluoroscopy time and increased confidence in their ability to navigate percutaneous catheters within the heart. Clearance for the integrated system by the U.S. Food & Drug Administration (FDA) is expected by mid-2008. "We find it much easier to move catheters within the 3D cardiac space utilizing the CoHesion Module and, as a result, we are performing complex procedures with much greater confidence," said Professor Stephan Willems, director of Clinical Electrophysiology at the University Heart Center, University Hospital Hamburg-Eppendorf in Germany, and one of Hansen Medical's most experienced customers in Europe. "Additionally, we are seeing a significant reduction in fluoroscopy time, and in some cases veins have been isolated with less than ten minutes of fluoroscopy time." 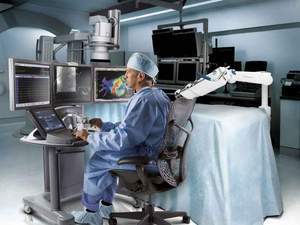 Hansen Medical technology was recognized in March 2008 by Frost & Sullivan, and presented with the consulting company's 2008 Product Innovation Award in the field of U.S. Image-Guided and Robotic-Assisted Surgery Devices. Hansen Medical, Inc., based in Mountain View, Calif., develops products and technology using robotics for the accurate positioning, manipulation and control of catheters and catheter-based technologies. Its first product, the Sensei Robotic Catheter system, is a robotic navigation system that enables clinicians to place mapping catheters in hard-to-reach anatomical locations within the heart easily, accurately and with stability during complex cardiac arrhythmia procedures. The Sensei system is compatible with fluoroscopy, ultrasound, 3D surface map and patient electrocardiogram data and was cleared by the U.S. Food & Administration (FDA) in May 2007 for manipulation and control of certain mapping catheters in Electrophysiology (EP) procedures. In the European Union, the Sensei system is cleared for use during EP procedures, such as guiding catheters in the treatment of atrial fibrillation (AF). The safety and effectiveness of the Sensei system for use with cardiac ablation catheters in the treatment of cardiac arrhythmias, including AF, have not been established. Additional information can be found at www.hansenmedical.com. This press release contains forward-looking statements regarding, among other things, statements relating to goals, plans, beliefs, expectations, objectives and future events. Hansen Medical intends such forward-looking statements to be covered by the safe harbor provisions for forward-looking statements contained in Section 21E of the Exchange Act and the Private Securities Litigation Reform Act of 1995. Examples of such statements include statements about the rate of adoption of the company's technology, the expected timing of regulatory approvals, plans for integrating technologies, beliefs about the future benefits of new products, expectations about the possible results from the use of new products and intentions to expand into new applications. These statements are based on the current estimates and assumptions of management of Hansen Medical as of the date of this press release and are subject to risks, uncertainties, changes in circumstances, assumptions and other factors that may cause actual results to differ materially from those indicated by forward-looking statements. Important factors that could cause actual results to differ materially from those indicated by such forward-looking statements include, among others, the risks and uncertainties inherent in the company's business related to: obtaining and maintaining necessary regulatory clearances; potential safety issues regarding the company's products; the scope of potential use of current and future products; competition from other companies; and the company's ability to successfully market and support its products. These and other risks are described in greater detail under the heading "Risk Factors" contained in Hansen Medical's Quarterly Report on Form 10-Q filed with the SEC on May 12, 2008 and the risks discussed in the company's other periodic reports filed with the SEC. Given these uncertainties, you should not place undue reliance on these forward-looking statements. We undertake no obligation to revise or update information herein to reflect events or circumstances in the future, even if new information becomes available. "Hansen Medical," "Sensei," "Artisan," "Hansen Artisan," as well as the Hansen Medical "heart design" are trademarks of Hansen Medical, Inc.
EnSite is a trademark of St. Jude Medical.